This is such a cute look for a cozy Christmas! I love all the colors in the poncho. I'm wishing for a white Christmas too but it won't happen here so maybe you will have better luck. Loving the colors in this poncho! I agree, cozy and chic is always want I want for family time. Oh wow, the colours in this poncho are so beautiful! I love how it's such a statement piece. You've really let it do the talking in this outfit, which was a great idea. Forever chic - Wishing you the best of the Christmas season! You are always stylish...this outfit is no exception. Love it from the poncho right down to the shoes (including the clutch). I just love the idea of playing games in front of the fireplace. Fireplace, check. Getting my husband to play a board game...forget it. LOL! Merry Christmas! Gorgeous poncho!! Love your whole look! I am IN LOVE with this poncho! It looks so cozy & chic. The colors in it are amazing too! Love the poncho, the colors are so nice! 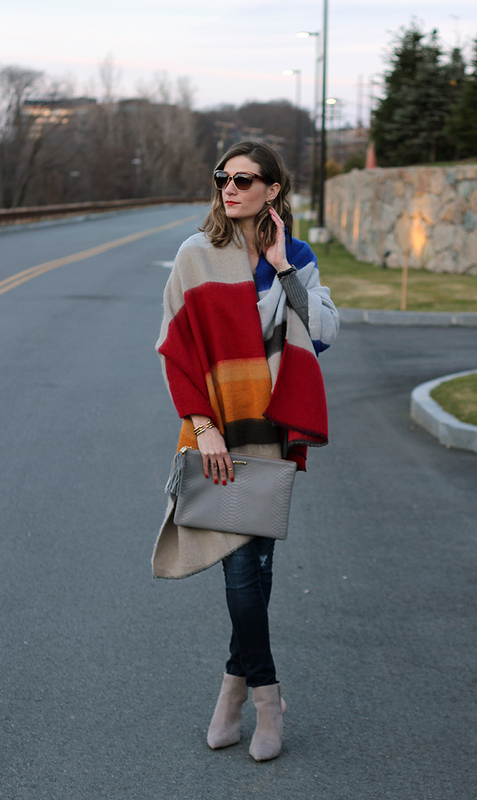 Love the blanket poncho - so cozy & chic! Enjoy your weekend lady! That poncho is so chic! The colors are gorgeous! The poncho looks so warm and cozy, and I love the colors! i like the bold colors! So regretting not buying this blanket scarf last year. I am glad Nordstrom has a similar one. Your boots and clutch ar gorgeous. You look beautiful.